There's a huge problem which I have no idea how to tackle. Picture this. There are two people living in the house. Neither of them have any idea of quantity. So a pan of rice either lasts them a week, or is just about enough for one meal, if supplemented with a slice of bread each. Sometimes there's just SO much rice left over, that I can't make enough things to go with rice that's steadily growing staler. It is at such a point, that this recipe of mine steps in. It makes use of leftover rice, adds yummy things into it, spices it up a bit and converts it into a whole new dish that you won't even need a side for. Just pick a fork (or spoon, I won't judge) and dig in. Presenting, my Moti Pulao. 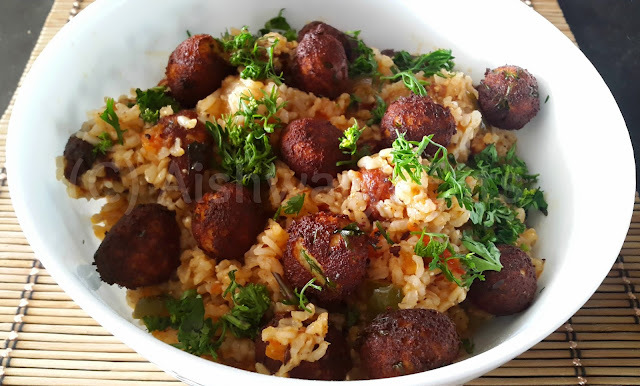 Prepared rice, spiced with onions, garlic, ginger and tomatoes, studded with crisp fried tiny marbles of fresh paneer, melting like mozzarella on the inside. Slightly heavy on the prep work, but man is it one impressive dish! Prepared rice, 1-2 cups. It can white or brown, as you have. 1 L milk, if you're making fresh paneer. 3-4 tbsp of vinegar, if you're making fresh paneer. 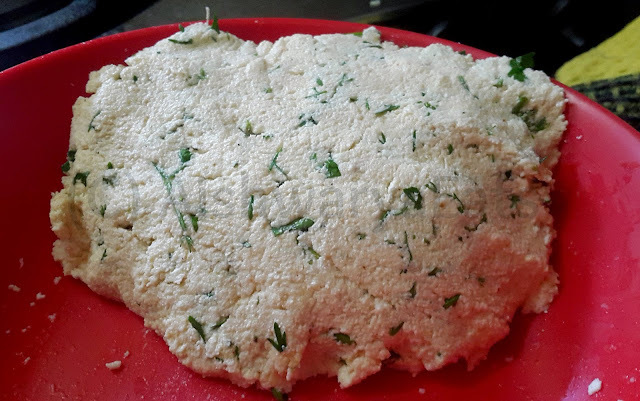 If you're not making fresh paneer, then about 250-300 gms of paneer should do it. 1 large ripe tomato, chopped. Oil, enough to deep-fry the marbles and then for the pulao. 1 capsicum chopped into smallish cubes, optional, though it tastes pretty killer. Jeera or cumin powder 1tsp. Chilli powder, kashmiri (for the colour) and deghi (for the heat), about 1/2 to 1 tsp, to taste. If you're making fresh rice for this, make sure you make it well in advance and lay it out under the fan, so that the grains are dry and don't stick to each other. Make the paneer first. Bring the milk to a rolling boil, add the vinegar 1 tbsp at a time, and stir. Soon the milk will completely curdle, leaving behind greyish-green whey and the milk solids. Don't add more vinegar than necessary. Strain the paneer, and retain the water. That stuff is gold for making rotis. Rinse it with drinking water once. Strain the paneer for a while, enough for most of the water to drain, but not so much that the paneer completely dries out. We need some moisture in there. Once that's done, crumble it up. If you're using ready paneer, then completely ignore whatever I wrote above, and just crumble it up. Using a hand blender or a mixie, blend the paneer crumbles till it's completely smooth. This was why we needed moisture in the paneer. If you thing it's turning into powder and not paste, add water 1 teaspoon at a time. Turn this paste out into a bowl. Add a bit of salt, just enough to cut the blandness. Add the sattu, a pinch of the deghi mirch and the amchoor. Add 3/4 of the coriander leaves. Now knead this till completely combined and smooth to touch. You should be able to make balls with it that don't fall apart. Try one, if it does, add just 1 teaspoon or so more of sattu. The ball should under no circumstance be doughy. 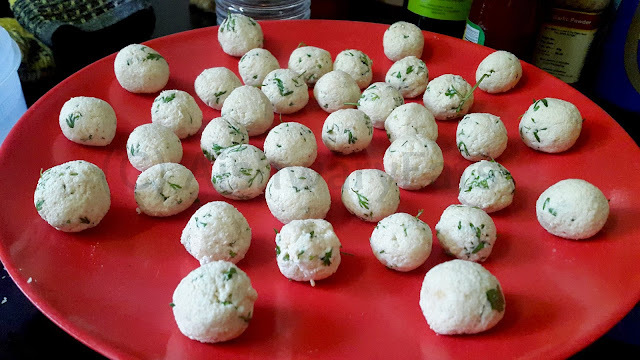 Make marble sized balls of this mix and lay it out on the plate, like so. Now heat the oil till it smokes. Reduce heat to medium, and very VERY carefully, lower 2-3 balls of paneer at a time int the oil. They will splutter and threaten to fall part, but hang on. Very very gently, push around the balls, turning them in the oil. They will turn brown on the outside very quickly, and even crusty. But don't be fooled, it's like melted cheese on the inside. It doesn't take more than 1 minute for it to be done. Take out very carefully onto a plate lined with paper towels. Finish the rest. Most of your oil should be finished from the frying. If you think you need more, add some more oil. Heat it on high. It should be just about 2-3 tbsp of oil in there. In one small bowl, take the tomatoes, ginger-garlic paste, turmeric powder, cumin powder, chilli powders. Add a little bit of water, maybe just 1 tbsp. Fry the onions till about pink. Add the capsicum pieces if you're using it. Fry well, then add the contents of the small bowl. Stir around well to fry. Add a tiny pinch of salt and sugar into the tomato. Cover the kadhai for a bit. This helps the tomatoes get all melty. When that happens, stir it vigourously. The add about half a cup of warm water into it to make a smallish gravy. Season it well with salt and sugar. Remember there's a load of rice that'll come into this and neutralise the salt, so add accordingly. 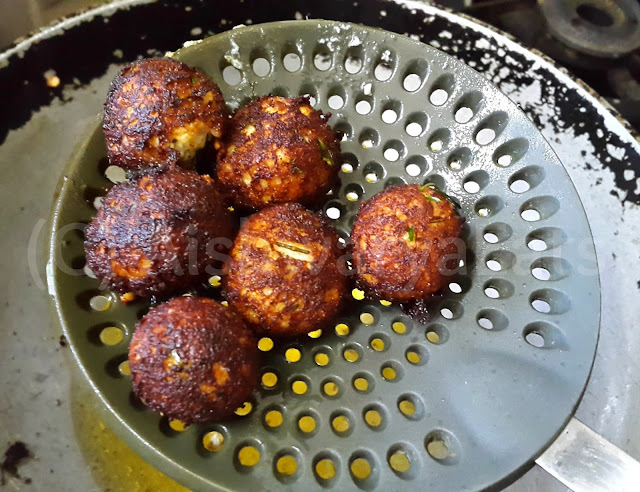 Stir it well, and gently add the paneer balls. Reserve a few. Very delicately, stir it around so that the balls incorporate into the gravy. Next, reduce heat to medium and add the rice, one ladle at a time. After each addition, stir it VERY gently, so that the balls and the gravy get distributed but don't break. Once all the rice is added, mix carefully. Turn off the heat and take out into the serving bowl. Stud with the remaining balls and coriander. This is a stunning dish, and seriously easy, if a little time-consuming. Try it, and I'm telling you, it just won't disappoint! Hi Aishwarya, I loved this recipe and I'm going to try it this weekend. I am a cook by choice and love experimenting with different types of home cooked food.Hopefully by next year, I'll have my very own set of recipes that I'll publish, inspired by hobby chefs like you! Keep sharing and inspiring. Yay do try it out and tell me how you like it! If you want, edit it as per your preference and tell me what you did. Babe... This looks utterly delicious and I am so tempted to try it. My only problem is I really don't know if it will turn out to be as killer as it looks and sounds when I make it as I am not a very good cook..
Di I'm telling you, it's really really easy. And end of the day, it's not all about how good a dish looks, it's all about taste. You can do it I know you can!